QuickBurst Ejection Charge Starters sell for $2.00 each. QuickBurst now carries Ejection Charge Starters, very similar to the Cosmos starters I once offered. 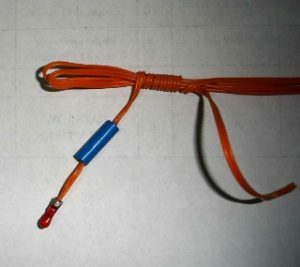 These starters currently come with 3 meter leads and are compatible with all known altimeters. I sell them as individual units, you are able to order as many or as few as you like. I did a little bench testing and observed the following. ARTS and ARTS2 – 100% success, each starter functioned as designed. Please note that the ARTS avionics are a little picky about ejection charge starter selection, all of my testing was performed using the two battery configuration. I would not suggest using these starters with the ARTS avionics in the single battery configuration. MAWD – 100% success, each starter functioned as designed. PerfectFlite HA45 – 100% success, each starter functioned as designed. Missile Works RRC2 – 100% success, each starter functioned as designed. Factory all fire are around 1 amp, similar to other offerings. Resistance measured is as follows, minimum 1.34 ohms and a maximum of 1.68. Averaging out to 1.52 Ohms. I also dipped them in QuickDip and let them dry overnight. Five out of six dipped matches lit the pyrogen, rather than blow it apart like most other starters do. The DOT classification above means that they can be shipped “USPS Surface Only” under my existing USPS letter of approval. In other words .. no HazMat fees. Shipping will be CON US only, International shipping is not allowed.